Gargano’s Restaurant. The Arthur Robinson Quintet. 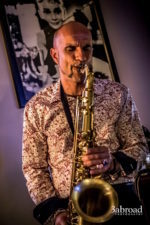 The Arthur Robinson Quintet comprises Murray Bishop Piano, Wayne Slater Bass, Richard Pooley Drums, Kim Lavery Vocals and me on Saxes, Flute and Clarinet. The gig kicks off at 3 till 6 pm on Sunday 1st April. Venue Gargano's Restaurant, 176 Stirling Hwy, Cnr Rockton Rd, Claremont. For an afternoon of swinging jazz and standards. And the food is excellent.